I originally wanted to put this up on Friday, but my phone camera just did not capture all of the colors like I wanted. And there are a LOT of colors in this look. So I thought, why not come up with something that looks like a painting? Still bold, but I won’t feel like I’m about to go to a costume party. Alrighty! So, I am always complimented on how nice my skin looks in my pictures (Thank y’all! 🙂 ), and to be honest? Most of it is just good makeup application/layering and filters. Yep, no shame. 🙂 Once I don’t sound like I’ve been gargling gravel (yay congestion! *side eye*) I have plans to do some videos on that. Till then: I use really good primers. So, Miracle Skin Transformer (white bottle) technically is meant to be used as a stand alone product (moisturizer, blurs, sunscreen, etc.) but I found that for my oily skin it is AMAZING under foundation to keep everything matte. Just, whoa. My eyeshadow primer is Urban Decay (classic non-colored one), because that is the first I’ve tried and it remains my favorite. So, prime first, then foundation. There’s two foundations there, but I don’t use them for contouring–because I am lazy and can’t be bothered. I actually have to mix shades to match my face, because these makeup companies have not yet realized brown folks ain’t all the same color. And it does not matter whether it’s an expensive or inexpensive brand, either. So, I buy inexpensive so I can afford to buy two and mix it. CoverGirl’s Ready, Set, Gorgeous is a fave because it gives a matte finish. Whew! It looks like a lot typed out, but application takes me less than 10 minutes. 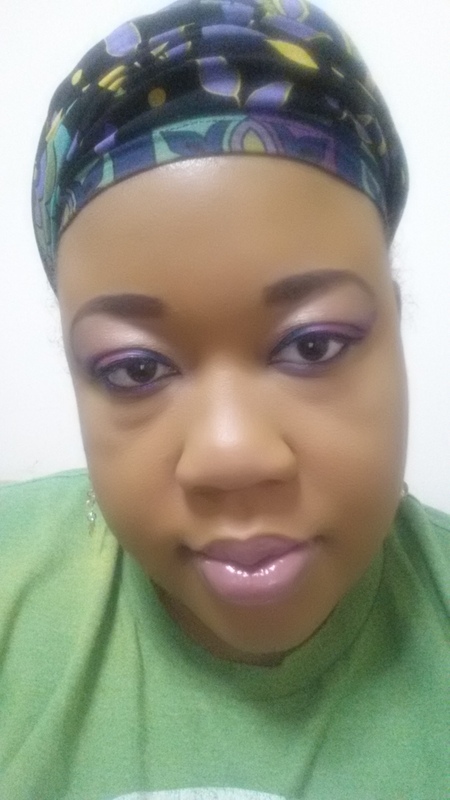 I do my brows next, and I use Milani brow pencil and Brow Fix Kit for that. And then: the meat of the look: all about the eyes. 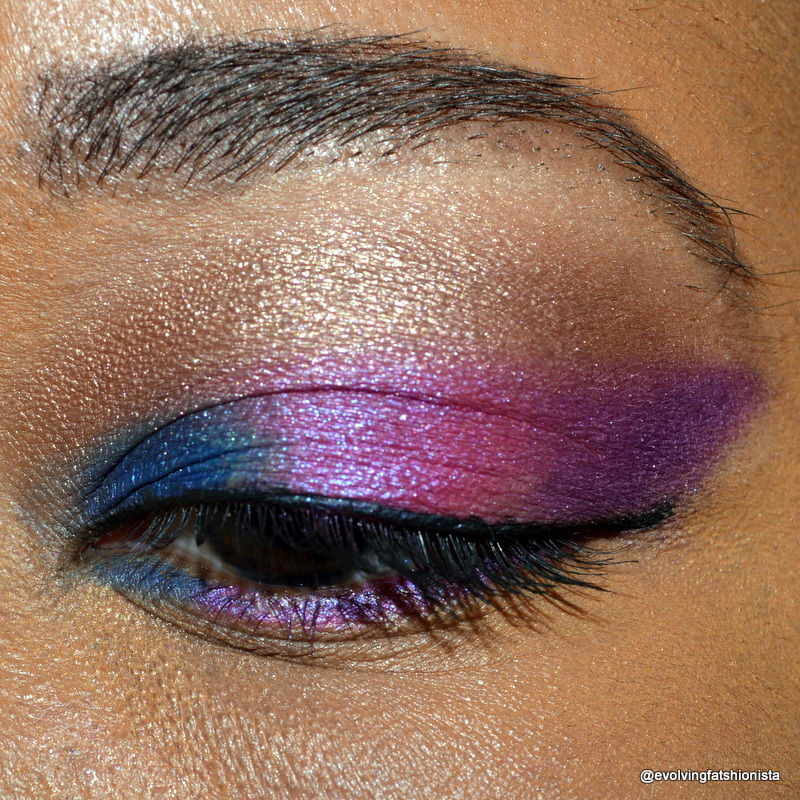 I used my Urban Decay Electric palette (Chaos, Gonzo, Jilted, Urban) and Stila Dare to Bare palette (Playful and Birthday Suit). Liquid liner is by theBalm (Schwing!<–no really, that’s the name of it!) and mascara is CoverGirl Clump Crusher in very black. Lips are Maybelline Color Elixir in Mauve Mystique. This is why I had to reshoot the look. Once I get back from vacation, I have plans to do a video tutorial of this look. Till then, a quickie: Take Chaos and line the inner corner of the eye, both top and bottom. Take Gonzo and tap just a bit towards the inner eye, take Jilted and tap it in the center of the lid, and take Urban and tap on the outer corner. Line lower lashes with Jilted, then Urban. 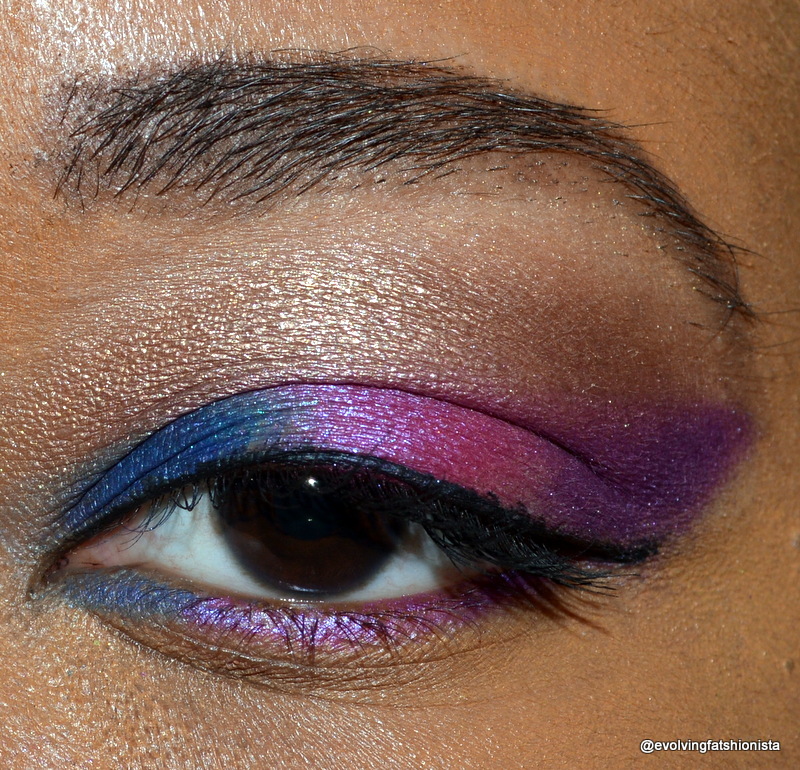 Put Playful in the crease; blend. Then take Birthday Suit under the brow line and blend. Do a little eyeliner, two coats of mascara, then done! 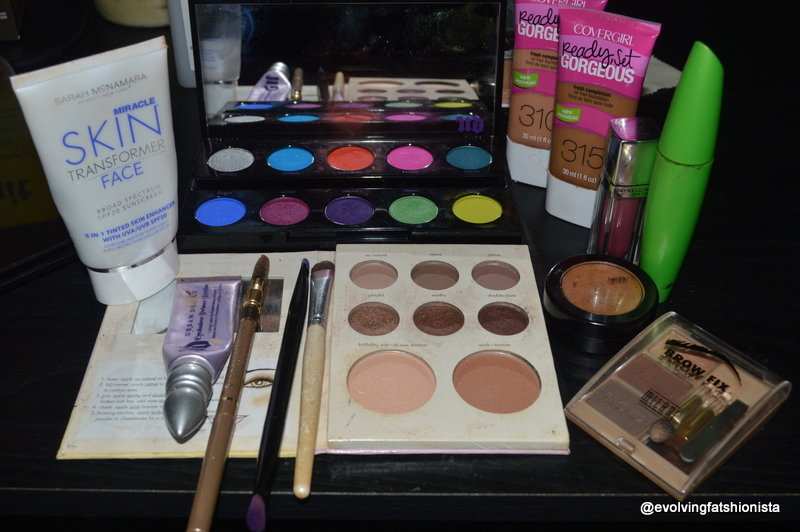 #bblogger #bright #cirque du soleil #happy #makeup #makeup looks #watercolor #when will it be warm?